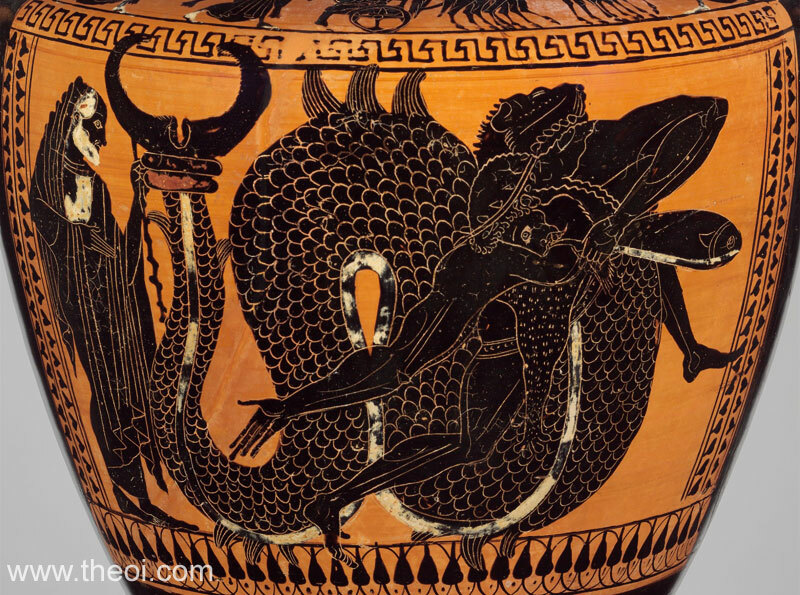 Heracles wrestles the sea-god Triton. The marine deity is depicted with the head, chest and arms of a man and the tail of serpentine fish in place of a lower body and legs. He holds a large fish in his hand. The hero wears a lion-skin cape and rides the back of the god clasping him about the chest. Nereus, the old man of the sea, stands to one side. He is depicted as a balding, white-haired man with a cloak draped over his head and bearing a gnarly staff resembling drifthood in his hand. The figures in this scene are all named on a similar vase from the same period (see image P10.1).